The Lumix LX-100 is Panasonic’s compact camera for the serious photographer, and the latest in a long line of LX bodies that cater to the enthusiast, and maybe even professional. 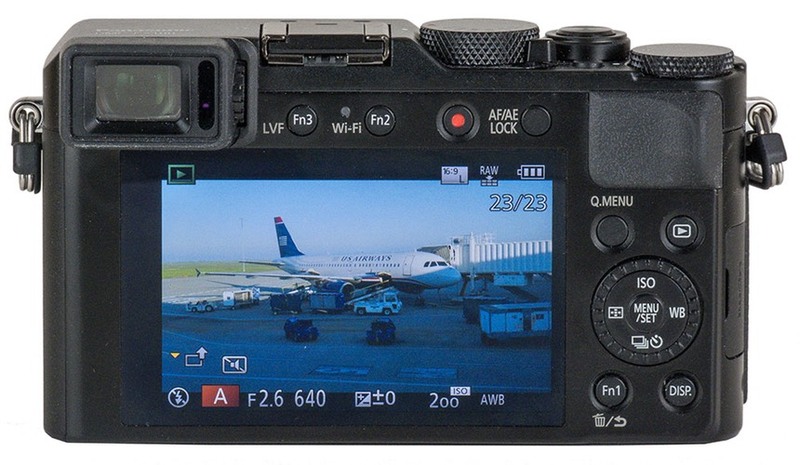 While the LX has grown bigger as Panasonic added things to it, those things are all very desirable changes in this latest creation: built-in EVF, a m4/3-sized sensor, and a 24-75mm (equivalent) f/1.7-2.8 lens, for instance. The first thing most of us old-timers notice is that, well, the basic LX100 controls are decidedly old-time: aperture ring, shutter dial, and exposure compensation dial. We also have switches for power, aspect ratio, and focus. The zoom ring can be a zoom ring (power coupled, not manually coupled, though, or it can be assigned to ISO, White Balance, and a few other things). In addition to the usual compact camera-like controls on the back, there’s also three function buttons and an AE/AF lock button (which is programmable). Yes. Exactly the kind of control we serious shooters like to see. The 16mp m4/3 sensor is a bit of a misnomer in the LX100, though. It never uses the entire 4/3 imaging area. Instead, what it does is use the multi-aspect approach we first saw in the GH series, where 4:3, 3:2, 16:9 ratios all provide about the same number of final pixels (generally a bit more than 12mp). There’s also a 1:1 aspect ratio. Why would Panasonic do that? Some of it has to do with designing a compact lens to mate in front of the sensor. It’s easier to design a fast aperture zoom that’s still small by limiting the image circle a bit, which is what multi aspect does. In the illustration above, the darker circle is how much bigger the imaging circle would have to be to give a full 4:3 rendering on the underlying m4/3 sensor (imagine the outermost 4:3 and 16:9 aspect ratio lines extending further to intersect). 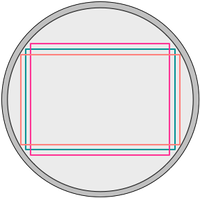 The lighter gray circle is how big the imaging circle actually is. In essence, the sensor is operating somewhere between the 1” and m4/3 sizes. For the same aspect ratio, I calculate the LX100 sensor close to 1.5x larger than a 1” sensor (Panasonic says 1.33x, though it’s unclear what they were measuring; multi-aspect does cause some definitional problems). The Leica-designed lens is a 24-75mm (equivalent) zoom that ranges from f/1.7 to f/2.8 as you zoom. From 24 to 28mm the lens gets rapidly less fast, then gracefully slows until it hits f/2.8 at 50mm (equivalent). While the lens sticks out only 3/4” (almost 30mm) when the camera is powered off, turning the camera on pushes the lens out to nearly 3” (about 70mm extended). At 75mm (equivalent) the front of the lens pushes forward a bit more. The lens uses an odd 43mm sized filter. The lens uses a 9-blade aperture diaphragm. You can focus as close as 3cm (a bit more than an inch). One thing that doesn’t get talked about much is that the lens uses Panasonic’s special DFD method for autofocus, first seen on the GH4. The way this works is that Panasonic has built profiles for how out-of-focus areas are rendered to help the camera figure out where focus should be. It takes two quick samples that are defocused from one another, and from that derives the exact position the lens needs to be at. And yes, this is done when the camera is focus tracking, too. For a compact camera, the focus is noticeably fast from the first time you use it. I’ll have more to say about performance of focus later. The EVF is at the top left of the rear of the camera, much like the GM5 and GX7. It’s an XGA-type screen with 2.76m dots. With glasses on, I can almost see 100% (the left/right is just a tiny bit cut off, and I do mean tiny). Magnification is 1.4x. Out back is a fixed 3” 921k dot LCD. This display does not feature touch technology, which was a little surprising to me, as Panasonic was one of the first to get on the touch bandwagon and does touch quite well. The shutter speeds range from 60 seconds to 1/16,000 second. So yes, we’ve once again got Panasonic’s mechanical/electronic shutter combo. WiFi (802.11b/g/n with NFC connection) is built-in. Panasonic’s Image App (iOS, Android), allows you quite a bit more than some smartphone apps do when you’ve connected the camera and phone. You can use “tap to focus,” zoom the lens, bring up the Q.Menu, record video, set WB, ISO, and several other items fairly directly. Image App also supports pushing the phone’s GPS data to the camera. One of the “big news” things about the LX100 is that it can record 4K video at 30fps or 24fps (it also does 1080P/60/24). Normal HD is a maximum of 28Mbps in the usual AVCHD format. 4K video is recorded as MP4 files. Indeed, it took me awhile to figure out that the only way you can put the camera into 4K mode is to select MP4. Panasonic offers two add on accessory lenses for the LX100, one wide angle (0.43x) the other telephoto (2x), but save your money. They’re poor matches in quality to the camera. The camera doesn’t have a built-in flash, by the way, though it does have a hot shoe for the included small external flash. Indeed, that flash is wicked small, though that’s still big enough to push the flash up higher than it usually is on compact cameras. GN is about 21’ (7m). 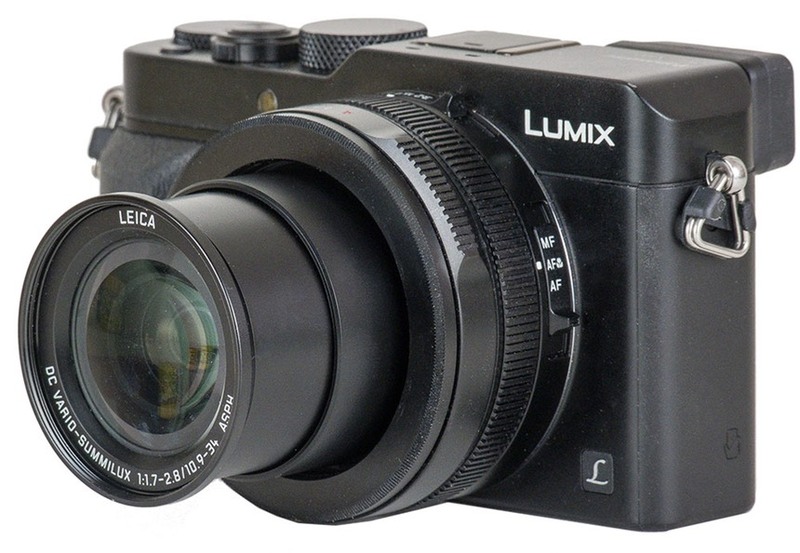 Curiously, Panasonic has a US$140 optional optical viewfinder for the LX100. This is essentially a fixed 24mm (equivalent) bright line finder. It sure looks like some other such OVFs I’ve seen at higher prices ;~). The camera takes the DMW-BLG10 battery, which is good for 300 shots CIPA, according to Panasonic. The LX100 takes SD cards in a slot in the battery chamber at the bottom of the camera. Overall, the camera is a reasonably hefty 13.9 ounces (393g), and it’s outside dimensions are about 4.5 x 2.6 x 2.2” (115 x 66 x 55mm). Not as small or as light as an RX100III. The hot shoe is centered on the lens, but the tripod socket is offset (and way too close to the battery compartment door. The camera costs US$899, is available in black or in panda (silver on black), and is made in China. The hand grip is a bit shallow, but at least it’s there. Coupled with the rubberized texture and a fairly big thumb rest on the back, you can one-hand this camera should you need to. If you have big hands, that might not be true without some additional grip. In some ways, Panasonic has regressed on menus, which is a shame. Any given page has only five selectable items on it, which frankly, is not enough as it induces lots of scrolling to find what you’re looking for. But it’s actually not the five-per-page thing that bothers me most, it’s the use of fonts and shading. At the bottom of every page is a Return/Set reminder (with icons). It looks like another menu item you can select because the font and shading is the same. Yes, I know that it just stays there and I should get used to it, but it’s a visual illusion that still bothers me. Make the font size smaller or different, and shade the bar differently, please. We do get a shaded bar at the top, which provides a short description of the currently selected item at the default setting. So I don’t understand the bottom bar not being also shaded. Once again, Panasonic menu abbreviations are annoying, at least to us Westerners. SHTR, MSHTR, ESHTR, PIP, DEFLT, . Even longer terms can be head-scratchers without help iA, i.Dynamic, i.Resolution. Yes, “i” is for “intelligent,” but does that make all the regular settings dummies? A camera like this doesn’t need a long string of “better automatic” modes. And I question the “better” part in the first place. Also, the help is often not help at all. At one point the camera displayed "Select range of level of i.Dynamic.” Uh, okay, but what’s i.Dynamic? And why am I choosing levels for it? I’m sure the Panasonic engineers know, since they’ve been putting that function into every camera they make for awhile now, but guess what guys, someone that’s bought a Panasonic camera for the very first time will be totally baffled. i.Resolution, too, though most people will figure out it has something to do with resolution. Other menu choices are also initially baffling until you figure them out. A still camera icon behind a video camera icon versus a video camera icon in back of a still camera icon? You mean Still Settings Priority versus Video Settings Priority? There’s a bit of a dissonance between the retro major controls (aperture ring, shutter dial, exposure compensation dial) and the rest of the controls. The AE/AF lock button, which is programmable and arguably the most useful and reachable button while shooting, is a little nub that barely sticks out of the camera body, not something that your thumb just automatically gravitates onto. Indeed, once you get past the dials and switches, the camera is very unfriendly to glove users. Very small buttons, five of which are recessed (the record video button is thankfully one of these). Moreover, the two buttons up top absolutely contradict the target purchaser: iA and Filter, neither of which are programmable. These top buttons would be better choices for function buttons (if they were beefed up), as they are also easily accessible and findable during shooting. While I’m at it, why the default for the iA button is Single Press I don’t know. If you accidentally tap the button, you’re now in iA mode. The default (or DEFLT in Panasonic abbreviations) should be Press and Hold. Another common problem with retro controls: they sometimes lie to you. Obviously, this is a variable aperture lens. But the aperture ring isn’t “variable.” So if you set f/1.7 on the ring, you might not be getting f/1.7. You have to look at the LCD display to see what’s actually set. Of course, if you set f/2.8 on the ring, the ring never lies to you. The good news is that the lens remembers that it should be at f/1.7, so if you start zooming back below 50mm (equivalent), the camera will give you as close to f/1.7 as it can if you’ve set f/1.7. Connecting my iPhone to the LX100 via Image App was relatively straightforward, though I couldn’t get it to use the QR Code displayed on the camera back instead of typing the password: apparently my iPhone doesn’t focus that close ;~). Image App seems relatively robust compared to many of the mobile apps I’ve used that control cameras. Delay is relatively small, and for the most part Image App tries to mimic the camera’s UI as best it can (menus look and are different, though). But there was one small issue: if I logged off the camera’s network with the phone, the camera didn’t let go of its side of the network and revert to normal use. I had to shut the camera off to get back to “camera” mode. This appears to be Panasonic’s way of making sure the camera isn’t the culprit in losing connections (WiFi is also activated the minute you get to the WiFi menu). So maybe it’s what’s the least of two annoying possibilities? 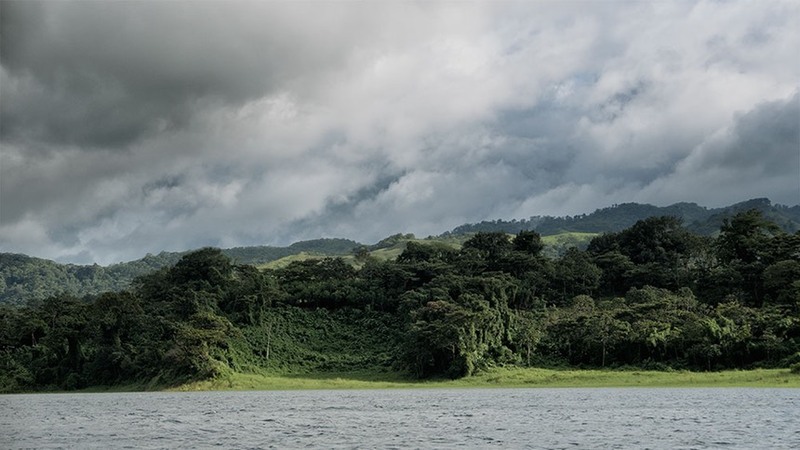 One final comment: in two weeks of using the camera in Costa Rica, I’ll bet that at least a dozen times the exposure compensation dial got moved from it’s position, typically to -3. While the dial is stiff, it still sticks out enough at the edge so that moving the camera in and out of a small cloth case was resetting the dial on me. I didn’t have this problem with the shutter speed dial. 4K Video: Okay, yes, you can shoot 4K video in low light with an f/1.7 lens and a big sensor. 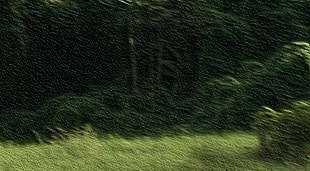 No, it doesn’t look particularly awesome (generally because of shutter speed and compression). You’re ending up with 8-bit 4:2:0 compressed data, which seems like it’s contradictory to the notion of 4K. A bit like using a 36mp still camera to shoot JPEG images to post on your Facebook page ;~). The video quality is pretty good in decent light, but be aware that you don’t have good manual control over focus when shooting video, and the autofocus will do some hunting from time to time. Basically, the video features in still cameras keep reminding me that they’re video features in still cameras. The LX100 is no different in that regard, though it does let marketing slap “4K” any and everywhere they want to. Lens: It appears that Leica designed the lens for stronger corners than you’d typically find in compact cameras. Certainly the corners look like they hold acuity better than the Sony RX100III. But the center, while very good, isn’t quite as strong as the Sony. I also see some minor chromatic aberration towards the edges, especially 24mm (equivalent). Still, the lens is very good across the board at 24mm (equivalent), while at 75mm (equivalent) the corners are good enough to push that to excellent. I’d also tend to say that the lens is strongest at the extremes. Close up in the mid-range the lens gets a bit weaker optically, but never enough that it worried me. I’d rate the lens a bit stronger than the Sony’s in terms of optics, though I did note that its rendering seemed a little cooler. Focus: The DFD technology works pretty well. This isn’t exactly a camera that you’d stress with tricky motion following, but it does decently enough at that. Mostly, I was impressed with the fast snap of single servo focus. It took really low light or contrast to make the camera slow in terms of focus. I also appreciate the ability to remove the focus from the shutter release and assign it to the AF/AE Lock button (e.g. AF-On). I’d have to say that the LX-100’s focus performance is the closest to a DSLR type of performance that I’ve seen in a pocketable camera. The camera also has a macro mode to the lens, which lets you do reasonably close focus, and this, too, shows pretty good performance. Overall, I can’t really find fault with focus. Just scale your expectations down somewhat from a DSLR and you’ll be satisfied with the LX-100. Yes, there was some noise in this image, but as I now expect from the m4/3 sensors, it’s manageable at ISO 1600 with some modest noise reduction. This image was shot wide open, so we’re seeing a bit of the quality of the bokeh that can be produced if you push it: decent, with no terrible flaws. I’m also at the close focus distance of the lens and it’s performing pretty well into that right corner (the left butterfly is a bit further away, so we can’t evaluate the sharpness there). What I found time and time again in LX-100 images is the following: noise is present, but generally very tamable without getting false edges; shadows were pushable easily be a couple of stops, so there’s a reasonably wide dynamic range; edge-to-edge sharpness tended to be very good; color was a bit muted in JPEGs compared to Olympus/Fujifilm, and even Sony, with perhaps a bit of a tendency towards magenta; full frame images reproduce well up to what I can print on my desktop inkjet. Yes, individual blade of grass are getting (mostly) resolved, despite the fact that I’m at 1/400 second on a boat in choppy water with IS off and at considerable distance using what is essentially a 12mp sensor. I’m not unhappy with this result. One thing I wasn’t expecting was that I had to watch my aperture setting. 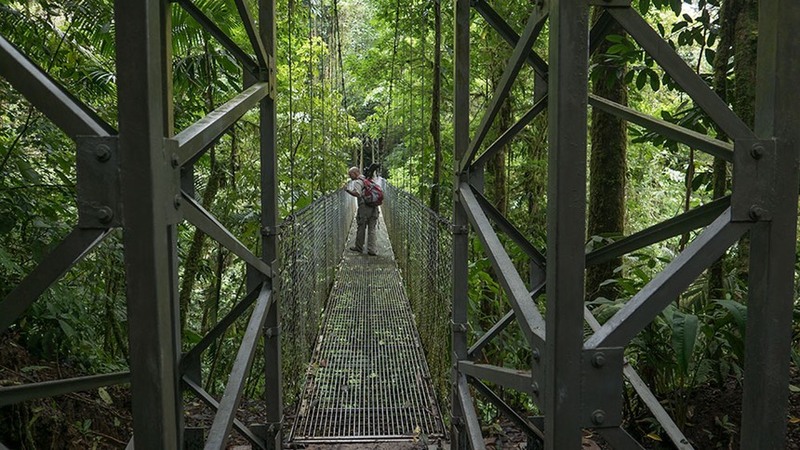 At f/1.7 in the above image, DOF isn’t keeping the far end of the canopy bridge in focus. The plus side of that is that you really can get out of focus backgrounds with this camera if you try hard enough. 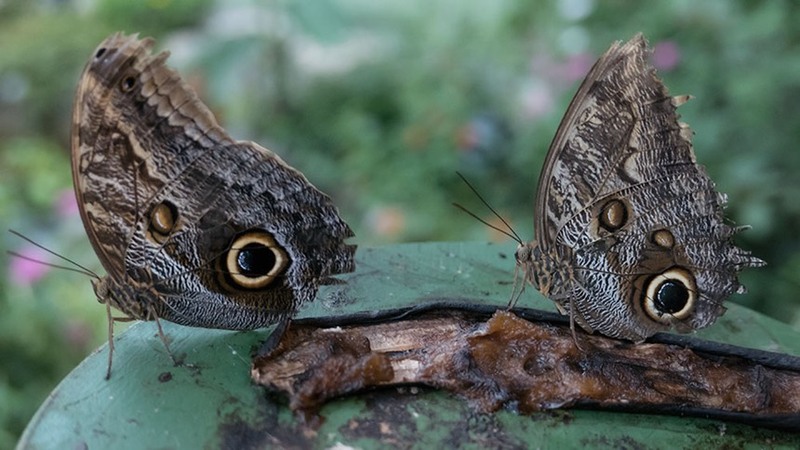 There’s a lot to like about the LX100. What it isn’t is a shirt pocket camera. So get that notion out of your mind right now. You probably don’t have a shirt that has a pocket it’ll fit into (I’ve got some travel shirts with insanely sized pockets, but that’s another story). The thing that struck me about the LX100 is that, once you learn your way around the UI and get the buttons programmed the way you like, it’s about as direct a camera as you can get, and will be very familiar and comfortable to a DSLR shooter. For stills shooting, I rarely dropped into the menus. Virtually everything I wanted to control was at a fingertip somewhere, including moving focus to the AF/AE lock button (e.g. AF-On). That’s the way photographers want cameras designed, thank you. 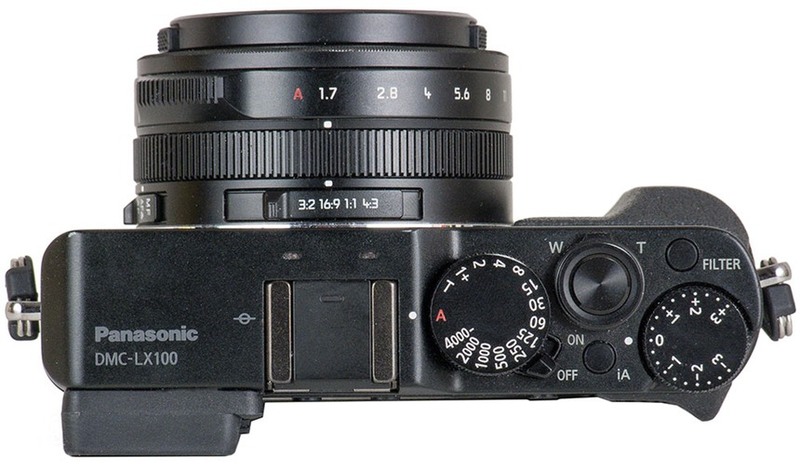 At the same time, the LX100 will be disappointing to some. The little add-on flash you have to keep track of, the non touchscreen LCD, small buttons in depressions, a weak battery, all these things detract a bit from the overall pleasure in using the camera. Moreover, there’s also cruft on this camera that doesn’t belong. All the i.Things should have really been simplified into one idiot mode button, for example. And yes, the camera does 4K video. No, I wouldn’t be buying it for that, and it just adds more complexity to what should be a rather straightforward product. It just seems that the Japanese camera makers can’t resist sticking in everything they know how to do, even though fewer than 1% of the purchasers will actually use many of those things. Still, the cruft is mostly ignorable. Which brings us back to basics: the LX-100 is a strong enthusiast camera that puts a lot of direct control into a users’ fingertips. It has excellent performance overall, even though the 12mp number may scare some users off. Which brings me to the LX-100’s main competitor, the other 100: the Sony RX-100III. In terms of image quality, Sony is pushing pixels, and the operative word there is “pushing.” Yes, 20mp is more than 12mp. But I’ve always felt that at the pixel peeping level the Sony struggles. I don’t get that same impression from the LX-100, where the pixels have a great deal more integrity to them (even as noise eventually intrudes at higher ISO values). No, you’re not going to produce 36” masterpiece prints from the LX-100. But you’re not going to do that from the RX-100III, either. It’s simply hard not to like the LX-100. A few minor changes and it would be a near perfect camera. But I can live with it the way it is.